This album always instantly reminds me of middle school. 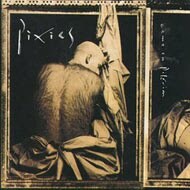 I, like you, fell for The Pixies pretty hard. I wrote their name on all of my textbooks and listened to their albums in a pretty heavy rotation, especially this one and "Surfer Rosa." They seemed so bizarre and mysterious to me back then. I never imagined that they were just 4 random people from Massachusetts. I honestly couldn't even fathom where they would come from. I assumed they were British for some time. Honestly. Oh, pre-internet life. I love this album because the first 2 out of 3 songs involve Spanish. This further confused me as a youth. I am pretty sure that I put "Isla De Encanta" on every mixtape I made in the 7th and 8th grade. Nice call on going song by song. I myself prefer this version of "Vamos." I would love to know why they recorded it again. I also never thought about the fact that Lovering only has one volume. Nice work.